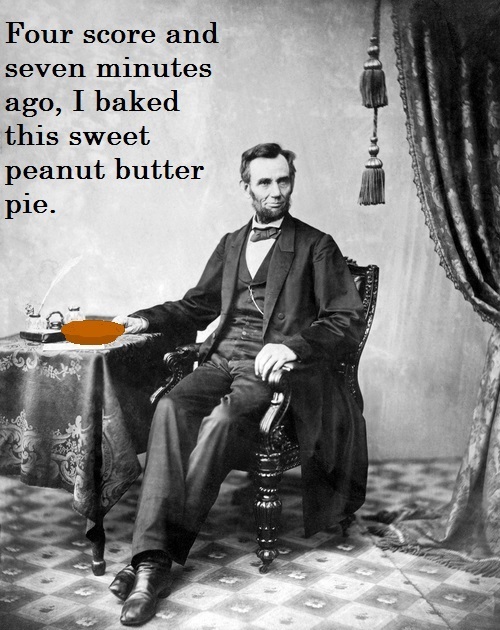 I've asked my readers last year and the year before to help me engage in a new American tradition: eating peanut butter pie on Presidents Day. Here's the thing: nothing else is going on for Presidents Day, aside from bank workers taking the day off so they could go buy mattresses on sale. But you know what is always a good idea? Peanut butter pie. Unless you have one of those pansy peanut allergies, there is no good reason why you shouldn't enjoy a slice of PB pie on the least appreciated federal holiday in the calendar. Hey, that new year resolution you made to not eat garbage? Hell's bells, everyone in the room knows full well you're going to eat an entire Whitman's Sampler on Valentines Day. And peanuts are technically a plant, which means that peanut butter pie is actually Atkins, paleo, and South Beach approved. Take the rest of the week to get the ingredients, fire up the stove, and prepare to engage in America.